2by2ForYou is committed to providing you the very best in our product line. We are also committed to helping you earn substantial income from the comfort of your own home. Access to our Kiss Retail Goodbye Card, where you will be able to save money on anything you can think of, along with Direct Sales Products in our Manager Package can enable you to work the hours you want and save money on your everyday purchases. Then, get ready, our General Manager Product gives you access to Alabama Wholesale Travel, where you will be able to take a vacation of your dreams at just a fraction of the cost! 2by2ForYou believes, “A Penny Saved is A Penny Earned!” How would you love to save money in the 8 Trillion Dollar Travel Industry? You will be able to do just that with Alabama Wholesale Travel. 2by2ForYou Regional Director and Executive Director members will have access to Coffee Cup News 4 You, where you will be able to stay up to date on current events and so much more. Get the most up-to-date information as Coffee Cup News 4 You is updated every 30 minutes. Your one-time product purchase of $25 gives you access to our Kiss Retail Goodbye Card which you can save you money on all your everyday purchases. You name it – You can find it here within the Kiss Retail Goodbye network. Whether you are looking for the smallest of items to high ticket items, you can save! You know the saying, “A penny saved is a penny earned.” By accessing the Kiss Retail Goodbye, you can save a ton of pennys. It’s like giving yourself a raise. You can use your savings from Kiss Retail Goodbye and put that amount to pay something else in your budget! 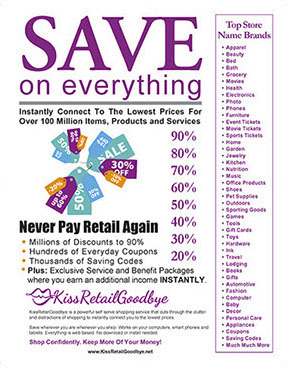 Once inside the Kiss Retail Goodbye, you will have access to some of the best coupons, promotional codes, sales, and specials on the internet today. Thousands of merchants with millions of products await you at the Kiss Retail Goodbye, with more being added daily. We have also packed the Kiss Retail Goodbye with benefits and services, along with FREE stuff and so much more! Each time you re-enter the Phase 1 Manager Matrix, you will, of course, continue to enjoy the savings on all your purchases through the Kiss Retail Goodbye, along with our Exclusive Benefit Package, maintenance of your replicated site, “live” customer service, back office tracking technology and marketing material. Your one-time product purchase of $50 gives you access to Alabama Wholesale Travel which you can save you money on all your travel needs. From a one night hotel stay to a vacation of your dreams – you will save money at Alabama Wholesale Travel. Whether you are looking for the smallest of items to high ticket items, you can save! You work hard all year long, it’s time to play hard at a fraction of the cost. Alabama Wholesale Travel can help you Enjoy Life Again. It’s time to take that vacation of your dreams at a fraction of the cost with Alabama Wholesale Travel! You’ll keep more money in your pocket to use on your trip. 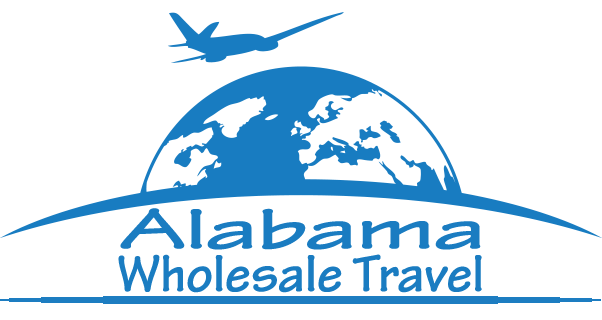 Once inside Alabama Wholesale Travel, you will have access to some of the best properties around the world at some of the best prices you will ever find. 7 night stays for as little as $100 for the entire week at some of the best resorts will be at your fingertips. You will be able to save on flights, car rentals, cruises, attractions, and so much more. Heck, you can even plan your entire itinerary and save a ton of money with just a phone call. Each time you re-enter the Phase 2 General Manager Matrix, you will, of course, continue to enjoy the savings on all your travel needs through Alabama Wholesale Travel, along with our Exclusive Benefit Package, maintenance of your replicated site, “live” customer service, back office tracking technology and marketing material. Your one-time product purchase of $100 gives you access to Coffee Cup News 4 You digital information center focusing on Health and Nutrition. Find out all the latest information with articles from major outlets. Your Coffee Cup News 4 You copy will keep you up-to-date with new articles added every 30 minutes! Coffee Cup News 4 You – Keep up with the latest information on everything Health and Nutrition. Start your day off right with the most recent articles and then throughout the day “stay in the loop” with new articles coming your way every 30 minutes! Each time you re-enter the Phase 3 Regional Director Matrix, you will, of course, continue to enjoy Coffee Cup News 4 You, along with our Exclusive Benefit Package, maintenance of your replicated site, “live” customer service, back office tracking technology and marketing material. Coffee Cup News 4 You Executive Edition – Keep up with the latest information on the breaking news around the world. Start your day off right with the most recent articles and then throughout the day “stay in the loop” with new articles coming your way every 30 minutes! Each time you re-enter the Phase 4 Executive Director Matrix, you will, of course, continue to enjoy Coffee Cup News 4 You Executive Edition, along with our Exclusive Benefit Package, maintenance of your replicated site, “live” customer service, back office tracking technology and marketing material. Start Moving Forward On Your Path To Financial Freedom Today!